In 1979 the Foundation suffered the loss of its most zealous devotee, H.T. (“Tom”) Priestley, Deputy Chancellor of the University and the founding Chairman of the Foundation for Australian Literary Studies. Mr Priestley died suddenly on 29 August 1979. To mark his influential service the H.T. Priestley Memorial Medal was created in two classes, the silver medal for presentation each year to the winner of the annual literary award, and the gold for the occasional presentation to persons who had made an outstanding contribution to Australian literary culture. 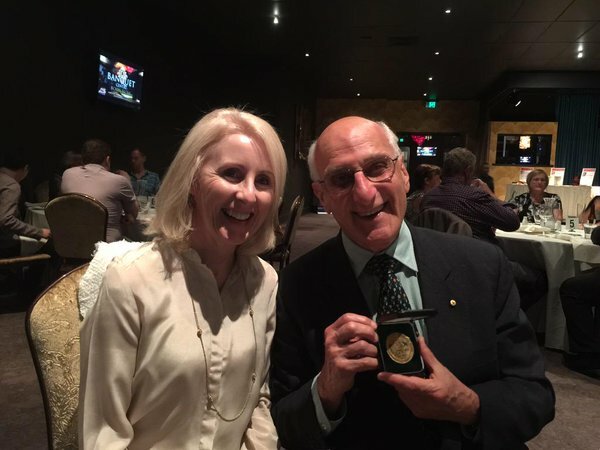 Pictured: Professor Sandra Harding, JCU Vice Chancellor and Foundation board member, with David Malouf who received the H.T. Priestley Gold Medal at the Savannah Writers Festival in 2015.